No question that card-carrying Greenies who think EVs are the future and the future is now will love the new Nissan LEAF. Others will simply have to decide if a vehicle with its admirable cost-to-benefit ratio makes the most sense as a second or third commuter car or as a substitute for a conventional hybrid. The Nissan leaf is a pretty nice and affordable car to use and buy considering that's it's used all electric vehicle. Much better that other electric cars on the market. In Eco mode, when letting go on the gas, the car automatically slows down without using the brakes. The only con about the car is the styling, the front headlights protrude out to much, but at least it's not a Prius. Coming home up the mountain. I get range anxiety when I do not know where the nearest charger is. I live on a mountain and it takes more power to get home than it does to go because most of my trips are down the mountain. If I start with full charge my trip down does not add but coming back up really drains the battery. . Leaf is great with battery life issues. I love my car, it just does what I want it to do. The problem is that the battery life does not last very long. I can only go about 45 min on the highway before I get to dangerous levels on battery life. I wish that the country had more charging stations. 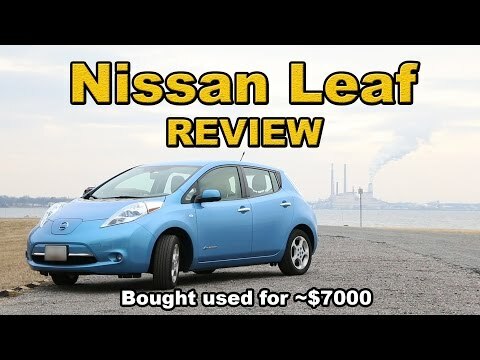 Buying a Used Nissan LEAF? Cost &amp; Charging.